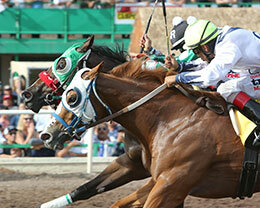 Stel A Secret (#2), under jockey Kevin Carbajal, holds off Ls Power(#6) and Juan Ramirez in the $42,180 AQRA President's Open Fall Futurity Sunday at Turf Paradise. PHOENIX, AZ—OCTOBER 28, 2018—Stel A Secret (11-1) vied for the lead early under jockey Kevin Carbajal then held off Ls Power to win the $42,180 AQRA President's Open Fall Futurity by a nose Sunday at Turf Paradise. Fastest qualifier and post-time favorite Showmethedoe bobbled the start but finished third three/quarters off the leaders. 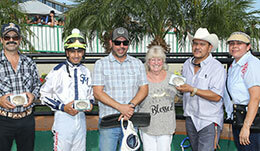 Conditioned by trainer Guillermo Morales, California-bred Stel A Secret completed the 350 yards in :17.669 seconds, a 96 speed index, to pick up the winners' purse valued at $21,090. Racing for owner Ruben Jimenez, the daughter of champion sire Stel Corona got her first career win from four starts this season. E.J. and Mark C. Thompson bred the sorrel filly from the Check Him Out mare Secret Forest. Steal A Secret also qualified for the AQRA Spring Fling Futurity in her first career start last April. LS Power, a son of multiple stakes sire Louisiana Senator, earned $8,436 for finishing second. Benito Guillen Vega trains the bay gelding for owner Deni Rodarte Puente. Bred in New Mexico by Joe David Yates and Roger Beasley, LS Power is out of the Desirio mare Neverleavin You. Juan Carlos Ramirez had the riding assignment. Fastest qualifier Showmethedoe, a daughter of All American Futurity(G1) winner No Secrets Here, bobbled the start but battled gamely under jockey Joseph Belloc, Jr. to finish thrid. Rigoberto Guillen conditions the Utah home-bred for owner/breeder Steve Berry. Out of the Hennessy (TB) mare Bundle Doe, Showmethedoe broke her maiden at Albuquerque in September before setting the fastest time in the October 14th trials. Second in the Utah Bred Futurity in July she has banked $26,077 this season. Whiskeys Quicker, Fabulous Daze, Captain Mazurk, Nicos First Cartel, Shez Ifs and Check This Wagon completed the field.